In it, a sad-sack scarecrow living in a processed-food dystopia dreams of turning his tiny garden into a bountiful farm (and eventually opens up a little burrito stand). While it may sound a little too cute, the video is actually quite striking… and clearly Chipotle was reaching for something ambitious. After the campaign launched, it was interesting to hear media experts comment on the “advertisement’s power” — because this is decidedly not an ad. This piece of brand storytelling content ran through social channels but never morphed into a television commercial or banner. Moreover, Chipotle never paid for placement. And yet, The Scarecrow got more than 11.6 million views on YouTube, more than 12,000 Facebook posts, and more than 31,000 tweets from more than 26,000 unique users — for a whopping total of 126 million impressions. At press time, Chipotle has the most fans of any brand on four of the top six social media sites, including Google+, Instagram, Twitter, and YouTube. Not bad for an “ad” that never ran on network or cable TV. What accounts for the project’s unbelievable success? For all the talk about The Scarecrow campaign, little has been said of the agency that worked collaboratively with Chipotle to create it: Los Angeles-based CAA Marketing, a division of Creative Artists Agency (CAA). CAA represents many of the most successful professionals working in entertainment, including Steven Spielberg, Robert Downey Jr., George Clooney, Jennifer Aniston, One Direction, Eminem, and Katy Perry, in addition to representing more than a thousand of the world’s best athletes — both on and off the field. In other words, CAA is an über-influencer in the land of culture influencers. Throughout the past decade, CAA has built a thriving entertainment marketing business, with dozens of strategic and creative marketing executives who work with colleagues across the agency, harnessing the power of entertainment to build brands and drive business results. The company represents clients interested in developing content so powerful it no longer needs to interrupt. To put it simply, CAA has made a strategic — and successful — push into content marketing through the technique of brand storytelling. Kirk Cheyfitz, founder of Story Worldwide, recently wrote in Chief Content Officer, “In a digital world where anyone can ignore anything, advertising must be as valuable as a good book, movie, or news story.” This notion — that brands must become as good as what professional storytellers produce — is like a dinner bell to an agency like CAA… because it already works with the most masterful storytellers on the planet. To produce The Scarecrow, CAA pulled in talent from its vast network: Academy Award-winning Moonbot Studios — animators for The Numberlys and Morris Lessmore — produced the video. Grammy-winning artist Fiona Apple sang the haunting soundtrack (a cover of Pure Imagination from the 1971 movie, Willy Wonka and the Chocolate Factory). Can you point to any other brand-created content with a similar lineup of artists and storytellers behind it? The Chipotle campaign began with a problem: The company felt that, even after 17 years of producing what it called “food with integrity,” customers knew little about its devotion to ethically raised livestock and family farms. What’s more, Chipotle divested from McDonalds in 2007, but many consumers still associated the brand with the fast-food behemoth. Jesse Coulter, Co-chief Creative Officer of CAA Marketing, explains, “We started with an idea… or the story we wanted to tell. Only much further down the line did we talk about execution.” This single idea — to put the story before the tactic — is profoundly important, and still we see few brands investing in this approach. Too often, mega brands are jumping head-first into where they want to broadcast their content before figuring out who they want to target and what they want to say (i.e., the story). 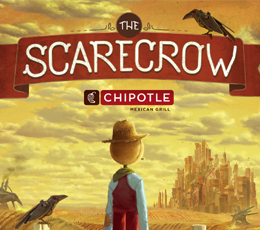 Chipotle’s The Scarecrow campaign points to a profound change in how agencies will serve brands. To do it successfully, however, agencies need to figure out how to attach metrics to these types of campaigns that are as incisive as those we get from paid units. Chipotle and the team at CAA Marketing decided that rather than talk about Chipotle food, the campaign would document the journey that ethically produced food takes to get from farm to plate. With the broad strokes of the story in place, Chipotle’s end-to-end strategy began to take shape. The team explored how to articulate and disseminate the message: How would they pull a single storyline through diverse channels and customer experiences? And how would they deal with the full gamut of commentary, from positive to deeply cynical? The Scarecrow became but one storyline in the campaign called Cultivate a Better World. CAA Marketing and Chipotle produced a virtual world app, as well as a massive food and music festival called Cultivate. Through these tactics — each targeting different customer segments —Chipotle introduced a difficult and complex subject (food with integrity) to a mass audience. Since its release, the campaign received some backlash from observers who felt they didn’t want a food-sourcing lesson from a company like Chipotle. But those detractors miss the point. Chipotle never endeavored to hector about food integrity. In fact, the company admits that to source ingredients at the scale necessary to supply all its burrito outlets, it at times must buy meats and produce that do not adhere to the company’s own guidelines. Rather, Chipotle hoped (and succeeded) in getting a wider audience to become curious about where their food comes from and how it’s raised. It sparked a conversation that’s still reverberating through social channels today. This article originally appeared in the April 2014 issue of Chief Content Officer. Sign up to receive your free subscription to our quarterly magazine. As Managing Director of figure18, Michael is a dynamic force in the content marketing world as a veteran speaker and consultant. As a TEDx Talker and accomplished musician, Michael is no stranger to the stage and enjoys entertaining people whether they want to learn, rock out or both! He is the author of Pitch Elevation: Your Guide To Becoming A Better Presenter. Ardath is also an instructor for the Content Marketing Institute Online Training and Certification program. In addition to the Content Marketing Institute, Michael is a contributor to I Have An Idea. Follow Michael on Twitter at @mikepweiss.